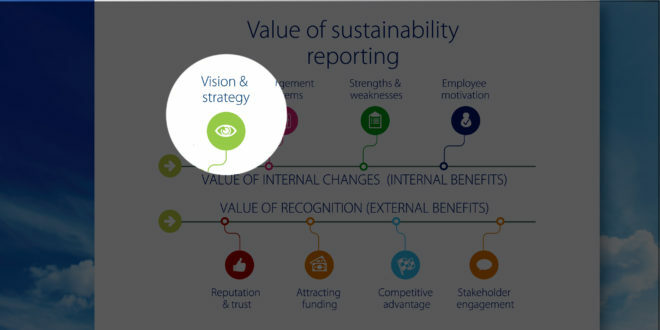 The reporting process helps companies reporting according to GRI’s Sustainability Reporting Standards articulate their vision and strategy for operating more sustainably, and for providing sustainable products and services. This is of vital importance in a sustainability platform, and also advances the coherence of values in the entire business. During the reporting process, companies saw a connection between the execution of the reporting process and the company’s strategy development. In addition, a company’s short- and long-term goals, and the strategies for achieving these goals, can be strongly affected by the reporting process. Having a clear, explicit vision and strategy enables an organization to align future policies, activities and decision-making to this reference point. A clearly understood direction helps an organization focus attention, influencing long-term strategic decisions.